My husband loves camping, but I must admit I really don't. I support him whenever he wants to take the boys camping and I even visit them for a meal or 2 if the campsite is close enough, but I have actually never been camping. I know, it's almost embarrassing to say : ) I blame it on growing up in the deep south. People just don't camp much there, unless it's actually in a cabin or camper maybe. It's almost always hot and humid and there are numerous insects and reptiles and other wild animals. Plus, there are no beautiful mountainous areas with clear rivers or streams. I did sleep outside in a sleeping bag one night every year when I would go to summer camp in Mississippi, but my husband says that doesn't count. I keep telling him that when I'm not pregnant and don't have a child in diapers, then we can do a whole family camping trip and I will go. But, I've had a baby or been pregnant for basically the last 20 years. Anyway, we will do that one day but in the mean time my daughters have been begging to go. My poor teenage daughter has wanted to go since she was 10, but she was always the only girl going along (my husband usually goes with another dad or two and their sons). Well, this year he finally promised to take her even if she was the only girl. He got it OK'd with the other dads and sons and so Anna spent 2 nights and 3 days camping at Jordan Lake with 9 other males. She did great. One day Ron even had the little girls out there with him for a good 7 hours. The baby and I came later and had dinner with everyone and brought the girls home to sleep in the soft, safe bed in a house with wonderful air conditioning! 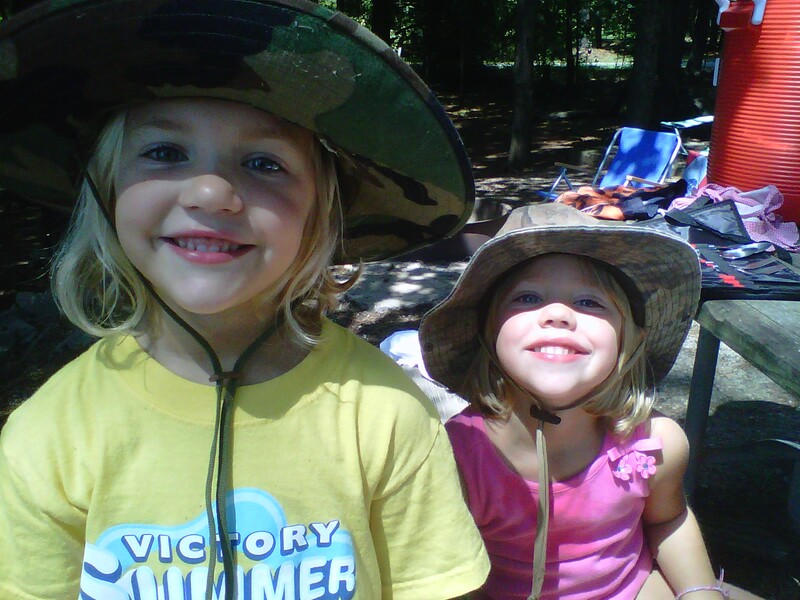 But now my girls are hooked and Caroline kept saying all the next day, "Daddy never told me before how much fun camping was!"